Do you like Rapunzel Design Your Rainbow Dress? Share it with your friends. Princess Rapunzel is already poisoned by the fact that she still wears the same dull dress and hairstyle and therefore has decided to make a radical change. 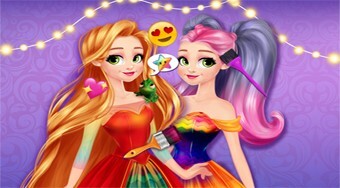 In the great game Rapunzel Design Your Rainbow Dress, your task will be to create a brand new rainbow color for Rapunzel and in the second step to revive her rainbow colors.